Learn how to make yo-yos "from scratch." 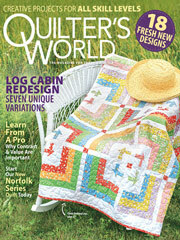 Use this easy-to-download free quilting pattern. Or make them with a yo-yo maker, if that's what you would prefer. Use your fabric scraps to customize the colors and stich a brooch, a bracelet and a necklace. Size: Necklace: 5" drop. Bracelet: 9" long. Brooch: 2 1/2" diameter.